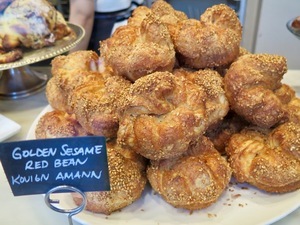 B. Patisserie’s location in Seoul will feature golden sesame and red bean kouign-amann. All photos: © tablehopper.com. 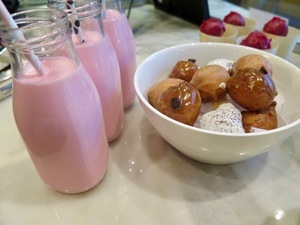 Meet Mochi Mochi, coming soon with mochi doughnut holes and flavored milks! 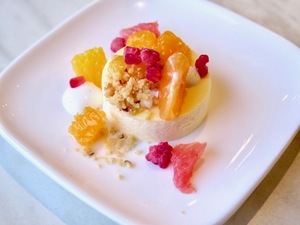 Citrus cheescake (a preview of one of the desserts at the upcoming dessert bar). 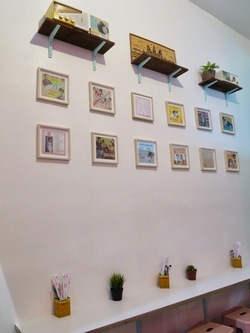 Last week, I got to attend the fifth birthday party of SF pastry and viennoiserie favorite ~B. PATISSERIE~, and business partners Belinda Leong and Michel Suas had so much news to announce, it made me wonder when they sleep. First up, they are expanding to Seoul, Korea, and opening in late April! We got to taste some of their Korea-bound creations (which are only going to be available there, sad face), like gochujang cheese sablé; hodo, or kinako, or golden sesame and red bean kouign-amann; and a gorgeous barley tea tart. Next up, Leong is launching a new brand, a completely different concept called Mochi Mochi, based on mochi doughnut holes (and some are stuffed with pastry cream!) in flavors like baklava, horchata, and Boston cream. She will also be serving flavored milks (iced or hot) in flavors like chocolate, strawberry, green tea, and cookies and cream. Like B., it’s going to start as a pop-up at venues around town while she looks for a permanent location. And then (I know! ), they are also launching a new “happy time” and dessert bar at B. Patisserie. The plan is to open once a month Fri-Sat 6pm-10pm and offer some savory bites and snacks that are happy hour meets teatime, like cured trout crostini with lemon ricotta. Another bite we had was the banh meatball, a play on a banh mi sandwich, with char siu pork belly that was confited, breaded, and fried (!! ), topped with a Kewpie remoulade with pickled vegetables used in banh mi, plus jalapeño and cilantro. (You and I both already know you want this.) And don’t forget, they have a beer and wine license! They will also offer a trio of desserts, like citrus cheesecake and an apple tart with vanilla Chantilly—it ends up Leong missed plating desserts in the restaurant world, so this is her way to get back to that. I will keep you posted on all these developments. In the meantime, don’t forget that it’s the annual lunar new year explosion of flavors over there (until March 4th! ), when you can preorder black sesame kouign-amann, honey mandarin or milk tea tarts, and “pineapple” custard buns. 2821 California St. at Divisadero. Get ready for some flava! The prahok ktiss at Nyum Bai. Photo: © tablehopper.com. 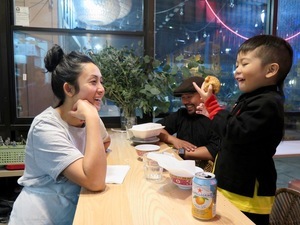 Owner Nite Yun with guests (celebrating the Lunar New Year and having nom krouch sesame balls!). Photo: © tablehopper.com. Nyum Bai’s wall of ’60s-era Cambodian rock ‘n’ roll records. Photo: © tablehopper.com. 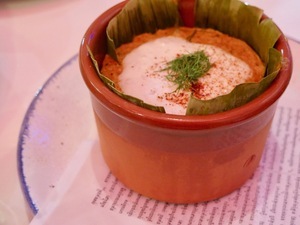 The amok (steamed fish in a coconut custard, so decadent and creamy). Photo: © tablehopper.com. 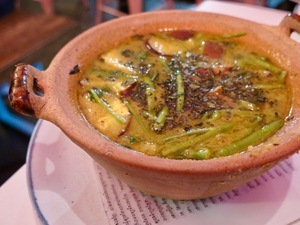 My favorite (so far): the classic machoo kroeung soup with spare ribs, eggplant, curry, tamarind, and so much more. Photo: © tablehopper.com. 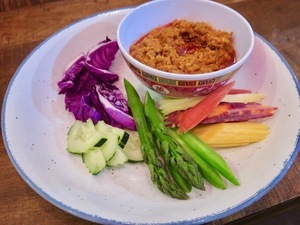 Now open in Fruitvale is ~NYUM BAI~, a soulful Cambodian restaurant from Nite Yun, a La Cocina incubator program graduate. Perhaps you have had her wonderful soups and more at her various pop-ups and stand at the Emeryville Public Market? Well, now she has her own brick and mortar (in the former Half Orange), and it’s conveniently a minute walk (if that!) from the Fruitvale BART station (she’s a hop and a skip from fellow La Cocina graduate Reem’s). I’m telling you, my ride over on a Friday night was faster than driving to the Mission and looking for parking. Lucky us, because you’ll want to head over soon for her soulful cooking. The name means “let’s eat” (or “to eat rice”), which is how Nite’s mother would greet guests, and that’s exactly what you’re going to do. There’s more to learn about the record covers on the wall (if you look closely, you’ll see they are colored photocopies of the actual covers). It ends up it’s extremely rare to even find ’60s-era Cambodian rock ‘n’ roll records because they were all mostly destroyed by the Khmer Rouge when the regime came to power in 1975—and many artists were subsequently killed in the horrific Cambodian Genocide. A staff member let me know there is an organization trying to track down recordings and reissue them, while identifying surviving musicians and family members so they can collect royalties. (I started rabbit holing on this music’s story, and you can join me—I will be listening to this when I’m off deadline.) So those covers aren’t just kitschy décor—they have quite a story to tell. As does her flavor-packed food. You can come by for lunch (the menu is full of affordable soups, noodles, and more), and there are some great bites to enjoy after work over a beer, like ginger fried chicken wings and the deeply flavorful prahok ktiss (stir-fried minced pork slowly simmered in coconut milk, salty prahok, fragrant kroeung, and sweet palm sugar) that you dip seasonal vegetables into. For a starter, you can share the rich and aromatic amok (steamed fish with fragrant kroeung, coconut milk, and egg served in banana leaves and topped with coconut cream and lemon zest) with your tablemates. It’s chilly right now, and what you want is the machoo kroeung soup (spare ribs marinated in fragrant kroeung paste with water spinach, eggplant, roasted bird’s-eye chile, curry leaves, prahok, and tamarind in a beef broth)—the soup was extraordinary with its deep flavor. I can’t wait to return for the kuri saramann (rich curry with braised short ribs seasoned with cardamom, ginger, and chile paste in coconut cream sauce, topped with roasted peanuts), which, it’s worth noting, is only $15.95—the most expensive item on the menu. Save a little room for the nom krouch (sesame balls filled with palm sugar) for dessert. The beer menu is full of quality local craft beers, from Fort Point to Temescal Brewing to Henhouse on tap. Shaken matcha tea and Khmer cold-brew also sound fantastic. It’s a tiny spot (but that didn’t stop a group of folks who came in for dinner! ), but there are counters where you can slide in, and there’s a patio that will be in use soon too. Lunch is served Wed-Mon 11am-3pm and dinner 5pm-8:30pm, closed Tue. You’ll find it in the Fruitvale Transit Village at 3340 E. 12th St., Suite 11 at 34th Ave., Oakland. ~CHOW OAKLAND~ has opened on Piedmont Avenue in Oakland (its third East Bay location, joining Lafayette and Danville). It’s not just a restaurant, but also a grocery store (including a meat and fish counter, dry goods, produce), bakery, and hot and cold prepared food counter. Read this post on Nosh for more. Open Mon-Thu 7am-9:30pm, Fri 7am-10pm, Sat 8am-10pm, and Sun 8am-9:30pm. 3770 Piedmont Ave. at Yosemite, Oakland. And then there’s the opening of ~AUGIE’S MONTREAL DELI~ (known for popping up at Beauty’s Bagels a couple of years ago), featuring smoke meat sandwiches (which is like a brisket love child of pastrami and corned beef), along with Canadian poutine and a reportedly notable smoke turkey sandwich. You can read more about owner Lex Gopnik-Lewinski’s smoke meat obsession in this Nosh piece. Open Mon-Tue 11am-3pm, Wed-Sun 11am-10:30pm. 875 Potter St. at 7th St., Berkeley. Weekend brunch at Kaya awaits. Photo: Alta Group. The Calle 19 Chix Parm at Media Noche. Photo: Hetal Vasavada. 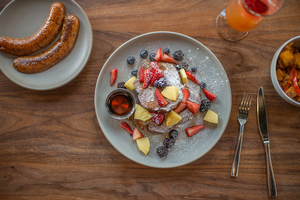 Now you can hang out at the vibey ~KAYA~ in Mid-Market for brunch on the weekend. Chef Nigel Jones and his crew are ready to feed you salt fish, ackee, fried dumplings, and bammy (I don’t know what that is but I want it); cinnamon French toast with coconut-battered challah, seasonal fruit, and blackstrap maple syrup; and house-smoked salmon with sweet corn bread. Rummy cocktails and mimosas await. Served Sat 10am-3pm and Sun 10am-5pm. 1420 Market St. at Fell, 415-590-2585. There’s a Sunday pop-up at ~BELCAMPO~ with Noodle Girl (Hang Truong, a graduate of La Cocina’s business incubator program) serving Vietnamese dishes made with Belcampo meats and Cali-fresh ingredients, like pho ga (slow-cooked Belcampo chicken bone broth with Belcampo chicken and fresh rice noodles), fresh corn stir-fry (shrimp, ground Belcampo pork, and green onion in a crispy cup), and others, all for under $16. Every Sunday through March 4th. 3pm-8pm. 1998 Polk St. at Pacific. There’s a new weekly delivery service for authentic Korean deli-style dishes (“banchan jip”) called Queens. Clara Lee—a New Yorker who left the tech world to follow her heart and cook (she was inspired by the cooking of her mom and granny and the freshness of NorCal ingredients)—is offering a weekly delivery service. Order by Sunday at 11:59pm and get food delivered on Tuesday evening. Details and menu on the site! Miss Liza Shaw’s chicken Parm from Merigan? Yeah, me too. 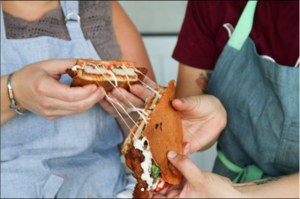 But swing by ~MEDIA NOCHE~ this month and you can enjoy her guest chef Cubano: Calle 19 Chix Parm (Parmesan-breaded fried chicken, fresh mozzarella, provolone, housemade marinara, and basil), all pressed and toasty. And 10 percent of the proceeds will benefit the SF-Marin Food Bank. Another pop-up: badass baker Le Dix-Sept is hosting Pastry Wednesdays at Chapel Hill Coffee in the FiDi. Come by from 9am-3pm for unique treats like banana cake and some wicked looking cookies. 670 Commercial St. at Kearny. 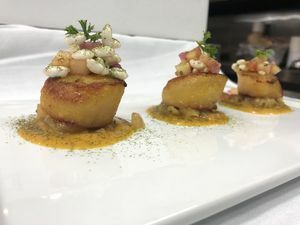 Seared scallops at Spice of America (with curry dust, masala onion confit, green apple bhel, and tomato chutney). Photo courtesy of Spice of America. A tablehopper reader tipped me off to ~SPICE OF AMERICA~ now open in the former Shido (previously Buck Tavern). The menu features Indian and Nepali dishes from chef-partners Krishna Timsina and Ram Ghale.​ They definitely seem to be pushing the plating into a more modern presentation; there’s a lunchtime special for $19, although I am so curious about the pao bhaji wrap (the dinnertime tasting menu is $45). Open Mon-Sat 11:30am-2:30pm and 5pm-9:30pm. 1655 Market St. at 12th St., 628-222-4051. There’s a new brunch spot in the Outer Richmond called ~LOKMA~, with a Turkish-influenced menu—you’ll find a Turkish breakfast with sujuk and menemen alongside breakfast sandwiches, omelets, and more. Open Tue-Sun 9am-2pm. 1801 Clement St. at 19th Ave., 415-702-6219. 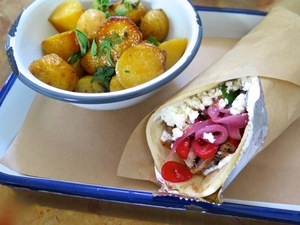 Bring on the juicy potatoes (at Souvla)! Photo: © tablehopper.com. The Marina will soon be able to get their lamb salad and frozen Greek yogurt on with the upcoming opening of the fourth location of ~SOUVLA~ in the former David’s Tea space on Chestnut Street. They are targeting mid-2018 for the opening, and it will mimic the Hayes Valley size and layout, with some outdoor seating. The full Souvla menu will be available from 11am-10pm, seven days a week. 2272 Chestnut St. at Scott. Last month, I reported on the closure of ~FRJTZ~ in the Mission, and now I received word that it’s going to be opening in the short-lived Bayou space around the corner (the New Orleans-inspired restaurant just closed). Frjtz expects to be open at the end of February. It’s a tiny spot, with just seven tables, but the bigger kitchen will help with their delivery and catering business. There will be a new look, more inspired by Viennese cafés, with red wallpaper and a chandelier. 3412 17th St. at Valencia. 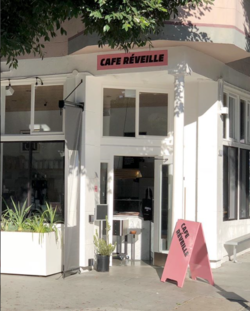 The airy new Cafe Réveille in the Lower Haight. Instagram photo via @cafereveille. Local coffee microroaster ~MEGAFAUNA COFFEE~ from Avery Burke of The Temporarium has opened up in the former Fine Mousse on Nob Hill. You won’t only find cold-brew coffees and espresso drinks—there are also some wonderful teas from Leaves & Flowers, plus horchata, kombucha, and healthy bites, like porridges and toasts and parfaits. And beer and wine. So many things! Check it out. Open Mon-Fri 7:30am-2:30pm and Sat-Sun 8am-3pm. 1098 Jackson St. at Taylor. 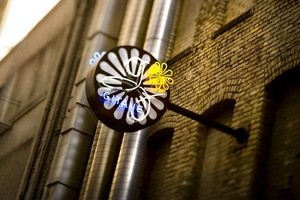 The sign at Gitane. Photo by Jeff Dow. A couple of closures for you, including the stylish ~GITANE~, which had its last dinner service on February 17th. Unfortunately, after 10 years in the location, the landlord didn’t renew Au Bon Repas restaurant group owner Franck LeClerc’s lease. But the good news: he told Scoop he is moving Gitane to a new location in the Galleria Park Hotel. It will be a more cocktail-driven concept called Bar Gitane and is slated to open in September (it’s opening in the former DB Shoes). 150 Kearny St. at Sutter.